NASHP (National Academy for State Health Policy) and KFF (Kaiser Family Foundation) have provided a 2017 interactive premium map for exchange plans in 2017. This map is for Benchmark plans in each county for a 40-year-old individual. The Benchmark is the second lowest cost silver plan. Subsidy eligibility is based on the benchmark plan. For California, cheapest premiums are in Los Angeles, Orange, Riverside and San Bernardino counties. San Diego and Central Valley are also on the lower end. Central Coast, Sierra and northern counties are higher with highest being northern Central Coast including Monterey, Santa Cruz and San Benito counties. 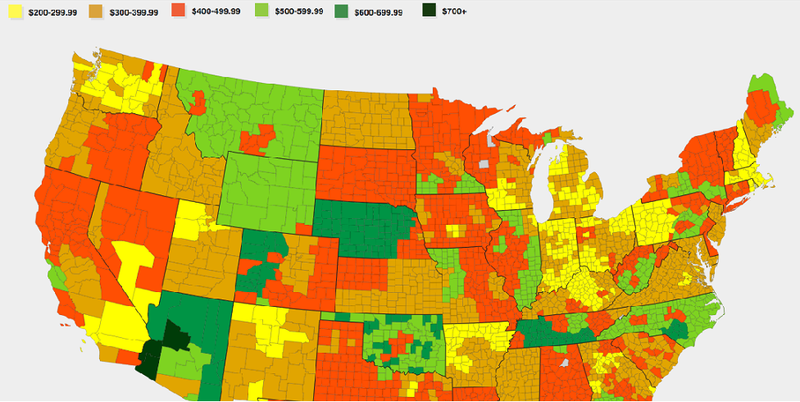 Several counties in western Arizona have the highest benchmark premiums at over $700 per month!